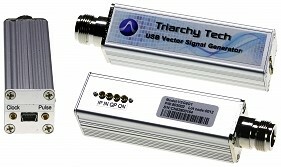 Triarchy's VSG6G1 is a very cost effective USB vector signal generator. Its capabilities are comparable to the basic functions of a regular full size RF vector signal generator. VSG6G1 is miniature and portable equipment, but it has more features and functions than full size analog RF signal generators, with frequency range up to 6.2 GHz, frequency sweep, and frequency hopping using I&Q modulation with arbitrary signal generator. It can generate most of all RF signal modulation so that many test functions can be customized to meet the needs of proprietary and other nonstandard wireless protocols. You can configure this device to meet a wide variety of test tasks. VSG6G1 is very suitable for the field test, because it is very small and convenient to carry. It can also work at ATE system as module, being able to simulate a lot of RF system for test purpose. YouTube video producer tomtektest has posted a very nice 5-part series on his test and evaluation of Triarchy's VSG6G1 USB vector signal generator. The unit under test was purchased through Triarchy authorized distributor Saelig Company. Note that in Part 5 the producer states in the comments area that he discovered the calibration file issue mentioned in the video turned out to be due to his overlooking a step in the installation instructions.